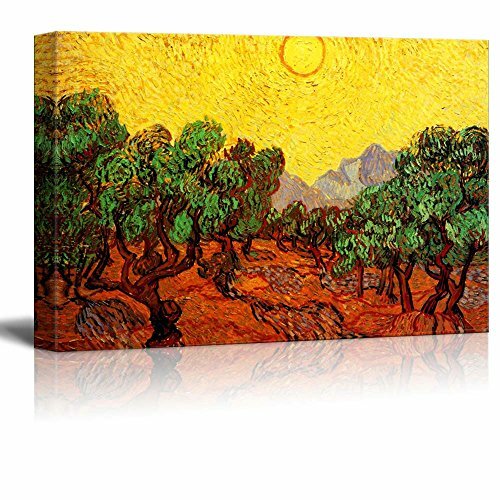 Olive Trees with Yellow Sky and Sun by Van Gogh Giclee Canvas Prints Wrapped Gallery Wall Art | Stretched and Framed Ready to Hang - 12" x 18"
Good quality print. The only thing I was disappointed with was the corner folds are a little bulky and awkward looking. It is nice that hardware was included to hang directly on the wall. I put this and another I ordered from the same company. It is high def...I have had two co-workers ask me who painted it. I laugh as I tell them it is a Vincent Van Gogh! It is fine, however next time I will order a different canvas .... this end wrap just does not work for me. After doing a lot of research to find a canvas, I am happy to say I chose the right one. The quality of this canvas is fantastic. The colors are very vivid. It such a beautiful piece to have in my house. This canvas hangs on a brick wall and I could not be happier with my purchase. Perfect picture next to my bar.